2018 Hackaday Prize Achievement: Your musical performance is so futuristic it can be categorized no other way. You are CyberPunk. This project was created on 09/23/2018 and last updated 2 months ago. Explore electricity in nature through artworks that sound like crickets, katydids, frogs, birds, and other non-human musicians. I don&apos;t use code or recordings, but old-school hardware and a power supply. In this project, I explain ways to portray various insects and how to randomize a natural chorus. I provide instructions for how to build your own piezo electric speaker in order to shape sound electrically and mechanically. These are techniques that I use to create electronic ecosystems that give nature-lovers insight into the spark of life, and urban dwellers an experience of the countryside. Technically speaking, my project is an artistic survey of primitive-interface audio synthesizers for natural soundscapes. I&apos;m biased towards the nocturnal insects of Virginia, but starting October 22, I&apos;ll be Hacking Nature&apos;s Musicians in the jungle of Quintana Roo, Mexico! This opportunity was made possible by Tortuga Escondida, GoFundMe donors, and Creative Capital. I am a visual artist who, in addition to painting and sculpting, works with the medium of electricity. My reasons are twofold: (1) I believe that electricity is the most important creative medium of our time and therefore paramount to contemporary artistic practice; and (2) I am fascinated by the spark of life in both biological organisms and manmade machines. Electricity has empowered humans to separate from nature in unprecedented ways, and yet electrical engineering gives us unparalleled insight into the nature of life on Earth. Through my art, I want to share my passion for electrical engineering and demonstrate its power to bring us closer to nature through understanding. I aim to reach a diverse audience, not limited to people with an engineering background. In this project, I do not use code or recordings to create sound --only hardware and a power supply. In today’s world of programmable logic and high-level interfaces, my return to 1970s-era technology might seem idiosyncratic, but to quote Forrest Mims III, “analog electronics parallels living organisms while programmable logic merely simulates life.” I use simple hardware because I want to gain insight into the transformation of electricity by physical components. Technical complexity makes it hard to understand what&apos;s actually happening. I would prefer to build these circuits using entirely discrete analog electronic components, to make the flow of electricity as explicit as possible, but I have found the cost to be prohibitive. This leads me to another important reason for my approach to electronic art-making: not only cost, but engineering complexity is a barrier for most artists. Electrical engineering has radically altered civilization but is not widely understood as a creative medium —certainly not by poets, artists, naturalists and other non-technical types of people. Most contemporary tools for electronic expression are high-level platforms with interfaces that distance the artist from a fundamental understanding of electricity. Of course we can use existing electronic devices to make art without any knowledge of electricity or engineering, but greater understanding of the medium yields deeper insight and a broader, more robust field of creative expression. 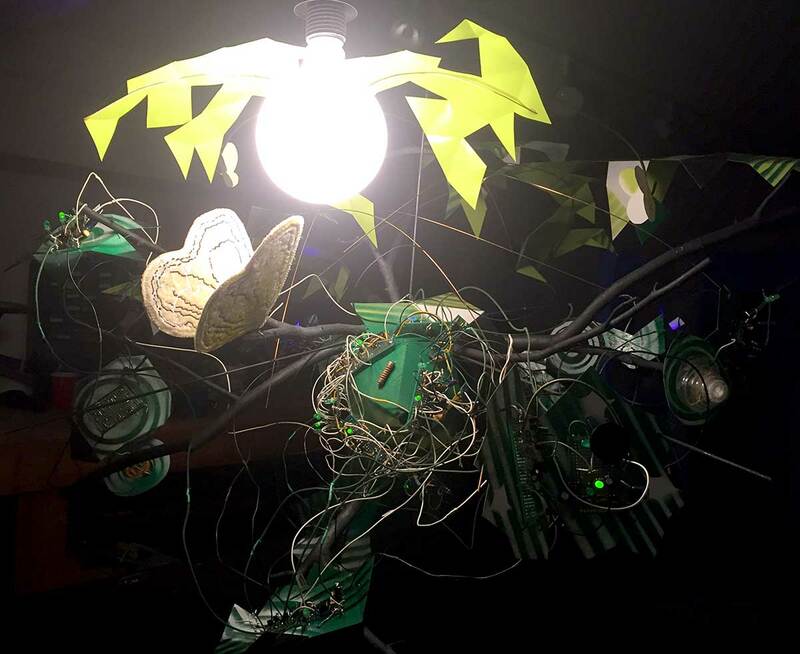 The circuits presented in this project are intended to delight with the recognizable sounds of nature, educate through design simplicity, empower with low-cost reproducibility, and inspire an appreciation for the art of electrical engineering. Basic, introductory "chirping canary" circuit based on Internet research, with my notes about ways to add variation in voice quality and tempo. 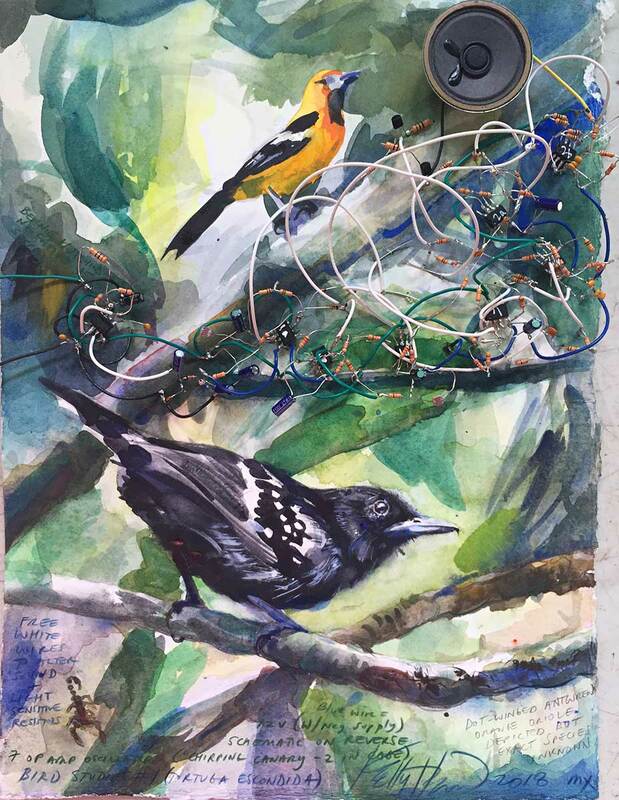 Detail of "Electrolier (September night in Virginia," 2018 showing an instance of my Mother Nature Board in sculptural form (the object covered in a tangle of wires). Detail of an "electrolier" sculpture that I built with circuit designs from Hacking Nature's Musicians. This photo shows my Mother Nature Board in sculptural format. Detail of an "electrolier" sculpture that I built with circuit designs from Hacking Nature's Musicians. This photo shows my "Lesser Angle-winged Katydid" circuit, which makes an intermittent, percussive rattling sound. I&apos;ve been remiss in my project documentation since returning from Mexico&apos;s Yucatan peninsula (and end-of-year distractions). This post covers the bird studies that I built during my time at Tortuga Escondida near Akumal, Mexico. For my residency, I took a miniature version of my electronics workbench with me for five weeks of study in the jungle, where hacking supplies are not only unavailable but subject to failure due to fluctuating voltages, high humidity, sporadic connectivity, jungle wildlife, and mischievous Mayan spirits called "Aluxes." Electricity really is different in the rural Yucatan than most modernized parts of the United States. It was a fascinating albeit frustrating experience to build delicate circuits in such an uncertain environment, especially after my oscilloscope died from any number of mysterious causes. I&apos;m not complaining, though -- it was one of the most memorable experiences of my life and gave me new appreciation for the complex relationships between electricity, nature, and culture. When I left, I donated my electronic supplies to the Akumal community center, hopefully inspiring some intrepid hackers in the pueblo. I plan to return. Wilf&apos;s Bird Sound Generator. This BEAM circuit is an ingenious use of a hex inverter chip with effects that are fun to play with due to feedback. I built several different bird sounds with this as the basis, including my recent "singing mama" bird. Parrot Sound Generator. There are multiple circuits included on this page, but the parrot sound generator was the only one that really intrigued me. It uses a center-tapped transformer as well as an inductor (or one side of a second transformer) to create a chirping sound thanks to some cool physics. All circuits are thanks to physics, but here it&apos;s really obvious because you&apos;re basically listening to electricity flow through a coil. The easiest component to use for the non-center tapped coil is an inductor. Out of curiosity, I tested an old transformer that I found in Mexico and the results were intriguing. As you would imagine, it sounds "big" as compared with a smaller inductor. @DJ Mystic confirms what I have long suspected -- it&apos;s not only the shape of a waveform (sine, square, triangle, sawtooth, etc), or the component type (resistor, capacitor, transistor, etc), but the *specific make* of a component that can affect pitch, timbre, and loudness. This is especially true for transistors, and I have also seen variation in capacitors. ...Yes... I have read blogs by audiophiles discussing the pros and cons of specific parts for hi-fi equipment, but I didn&apos;t fully appreciate the importance of component specificity in low-cost sound generation. For some reason I assumed that since I work with cheap parts, the make wasn&apos;t that important. For example, I have thus-far thrown 2N3904 transistors at every problem they will solve. Now I realize the power of expanding my palette. Fortunately, I&apos;ve got a friend coming down from the US and she&apos;s willing to bring a bag of electronics with her... so stay tuned for that excitement. As for progress in the past few days, I bit the bullet and breadboarded a circuit with op amps. My attitude may seem weird considering that most synthesizer enthusiasts live and breathe op amps... but the dual power supply annoys me (and I&apos;ve never gotten interesting effects with single-supply op amps). Fortunately, some years ago, Bernie Hutchins gave me a useful schematic to convert voltage from a DC supply into a negative voltage of almost (not quite) the same magnitude. If you have a 12 volt supply, you can produce negative 9-10 volts using a 555 timer and a handful of components. Please see my files for this handy "Negative supply" circuit or read about it on Electronotes. I added some photocell resistors plus a few wires that you&apos;ll see me moving around (poor man&apos;s patch synth) to get variation in the circuit&apos;s behavior. It&apos;s pretty interesting, but maybe not worth the effort because there&apos;s a fair amount of complexity for sound effects that can be achieved with fewer parts. Still, I might make one of my electronic painting / sound studies with it because I like the aesthetic of crazy-complicated circuits. Last but not least, here&apos;s a short video of a different bird circuit (the transformer one discussed in my previous log and shown in the background of the "two canary" video). I tested various capacitors and it&apos;s pretty cool the realistic bird sounds that you can achieve with such a simple component swap. Amazing as the insects are, I&apos;m not studying musical bugs because what&apos;s most remarkable to me --coming here from Virginia-- are the myriad species of birds. I&apos;ve decided to see what I can do with the analog electrical engineering of bird song. As a starting point, I built a version of the classic, "chirping canary" used in kitschy artificial nature scenes. Check out my files for an annotated version of this schematic, which is based on audio transformer oscillation. Basically, the surge in DC power that happens when you first turn the circuit on is capacitively coupled across the transformer and continues to fluctuate thanks to a transistor switch. If you change (or remove) certain capacitor values, the circuit stops oscillating and makes an unpleasant tone that can be very loud due to the current gain across the transformer. I&apos;ve made a first informal video showing how the sound changes when different parts of the circuit are modified (apologies in advanced for some unpleasant beeps - don&apos;t wear headphones). Birds are very clever singer-songwriters, so it&apos;s going to take a lot more work on tempo and pitch variation to get interesting songs. I plan to try numerous strategies to generate voice quality because I want to build a jungle of different bird circuits ranging from sparrows to whippoorwills to parrots to owls to a Resplendent Quetzal, relative of the legendary Mayan Plumed Serpent. If you have suggestions for circuits to try, I would be grateful. So... not only do my bird electronics need work, I could use a new "avian speaker" design. It seems that piezo buzzers are better suited to insects, while 8 ohm speakers have higher bird fidelity. Initially, this observation puzzled me (and I&apos;m still not clear) but I got some useful clues from the ingenious musician, Nicolas Bras. It&apos;s material physics: the thin, metal vibrations of a piezo disk have more in common with the chitin instrumentation of an invertebrate than the fleshy air bladder and vocal chords of a squawking bird. Some insects do force air through a membrane, like living kazoos, but crickets rely heavily on the idiophonic effects of leg or wing rubbing. The sound made by an idiophone is quite different than that of an aerophone or membranophone, like hitting a cymbal versus blowing through a reed, the latter of which happens when a bird forces air through its vocal cords. I searched the web for homemade instruments that behave like an aerophone with a membrane and found this cool "membranophone" video by tachionics. The video quality isn&apos;t great... (shot with my iPhone under bad lighting and extremely messy studio)... but hopefully you get the idea (see second video below). 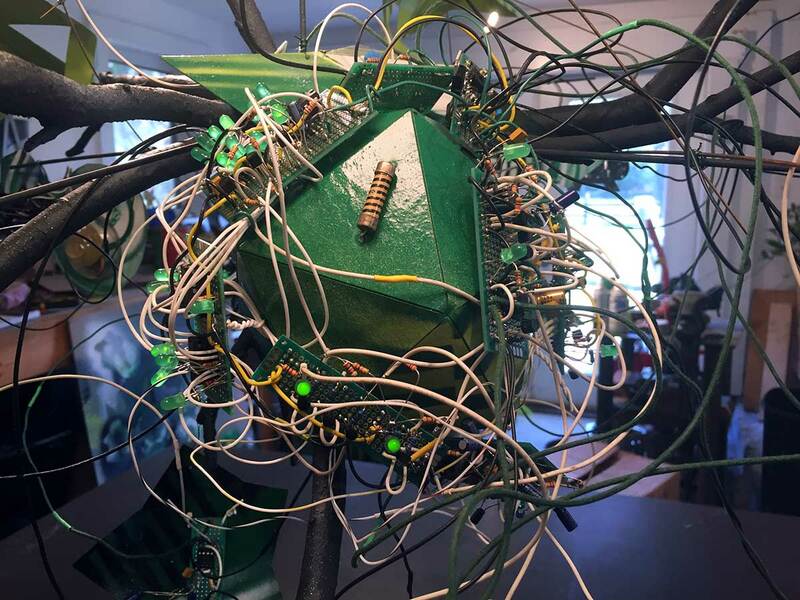 The sculpture contains one instance of my Mother Nature board design, recognizable by the dense tangle of white wires connecting logic gates, and six sound generating "animal circuits" each with its own speaker. The colorful graphics are spray painted cardboard, and everything is hung on a tree structure under a moon (globe pendant bulb). Oh, and that large moth is made out of silk velvet that I dyed and embroidered with an old industrial "Ultramatic" machine. I would have used small molex-style connectors to connect everything, but there was just no time. So... now I am packing my electronics bench into a suitcase and praying that security does not detain me at the airport. I&apos;m throwing in packets of desiccant and crossing my fingers that jungle humidity doesn&apos;t zap everything. Making analog electronic circuits in the jungle will be interesting to say the least -- stay tuned for the sounds of los músicos de la naturaleza en Quintana Roo! I&apos;ve been busy migrating my "Mother Nature" controller circuit out of my breadboard and into perfboard... and yes, it&apos;s insane but no, I don&apos;t have time to produce a printed circuit board because I&apos;m leaving in six days for a fellowship in Mexico. For the record, I do not recommend soldering so many components and connections in perfboard because the risk of error is high, either from bad solder joints, signal interference, or just plain confusion. I plan to design a printed circuit board for future embodiments of Mother Nature. Stay tuned. As you can see in my previous log, I&apos;m surrounding my perfboard circuits with spray painted cardboard to make them look cool -- and by the way, you could use this quick-and-dirty strategy to make a "starving artist&apos;s badge" for the Hackday Superconference. There&apos;s a limit to how many things you can drive directly with a signal such as the output of a logic gate. Good engineers read data sheets and calculate voltages and current at various locations in their circuit. Impatient engineers add a generic common emitter amplifier between the signal OUT from a logic device and the signal IN to whatever you&apos;re driving. This hand-waving approach to buffering will not work in all cases! But it will probably work for most slow logic applications where you want to transform a signal multiple times and drive some light loads. I&apos;m an artist who prefers prototyping to math, so I work a lot with "try it and see" circuit design. Plus, I am not building a nuclear reactor. Note that a common emitter amplifier will invert your signal. Pay attention to whether you need your signal to be active high or active low. Note that a 555 timer in monostable aka one-shot configuration is looking for an active low input. If necessary, invert the signal again to get what you need. Mosfets make great electrical "on/off" switches because they don&apos;t draw current on their gate (==the mosfet equivalent of a transistor&apos;s base). They just need a voltage. I use mosfets for the last step in my Mother Nature circuit, or the point at which I want to turn power on or off to a particular sound circuit (the load). Make sure you have a gate resistor to ground or voltage will "sit" on the gate even when the signal is low (and the mosfet won&apos;t turn off). I hope these tips are helpful. To end this log, I give you a video showing my Mother Nature circuit in perfboard with two sound circuits hooked up. If you watch the LEDs carefully, you will see how certain combinations of logic are triggering the sound circuits. The cricket is wired up to chirp most of the time, whereas the Katydid is triggered less frequently. For this demo, I hooked up only two sound circuits because it&apos;s already hard to understand what is happening, and more circuits becomes a sort of natural chaos... which is my goal, as you will see in forthcoming logs. I&apos;ve been migrating my circuits out of the breadboard and into soldered form. I&apos;m also hooking up speakers so that my sound generating circuits are ready for installation in a sculpture of Virginia&apos;s nocturnal ecosystem. Because most of my circuits use a custom piezo electric speaker (built with my own amplifier board), I have to install each piezo element into a physical housing... and there&apos;s some interesting "play" here. One electronic signal can generate many different sounds depending upon the speaker&apos;s physical design. Here&apos;s a video of me testing various installations of a piezo element for an insect that makes a steady background noise. It&apos;s cool to experiment with the interface between electrical signal and material properties. It&apos;s also critical to get it right, or else the piezo element will make a horrible rattling or screeching. Even a tiny drop of glue (to fix the piezo element in place) will alter the sound quality --usually the pitch-- and superglue can sound different from rubber cement or hot glue or tape. All of this is no news to a human musician, who knows that a note ill-played (even slightly) is a fail, and teensy subtleties often make the difference between average sound quality and genius. It is interesting to wonder what makes animals of the same species sound different in nature: is it their electrical impulse or their physical form? (Is it their schematic, their CAD file, or their bill of materials?) Members of the same species inherit the same circuit design as well as physique. External physical factors, such as climate, have some degree of influence over material properties of the body --for example, a dehydrated cricket sounds differently than the same cricket wet with rain; a fat frog sings a different tune than the same frog skinny; and so on and so forth. We also know that "animal circuits" are sensitive to electromagnetic fields, and capacitive coupling undoubtedly affects individuals in close proximity. I suspect that physical factors play a greater role in the variability of an individual&apos;s song if but for no other reason because birds sound the same whether they are sitting on a tree branch or an electrical transformer (at least, I think they do). PS: Eventually I will tackle the challenge of bird song, but their vocal complexity requires more computation... which is why I have started with insects. To end this log, I leave you with one more video clip of my "background noise" insect. Here it is with a plastic spool installed over the piezo (now painted green, black, and white). 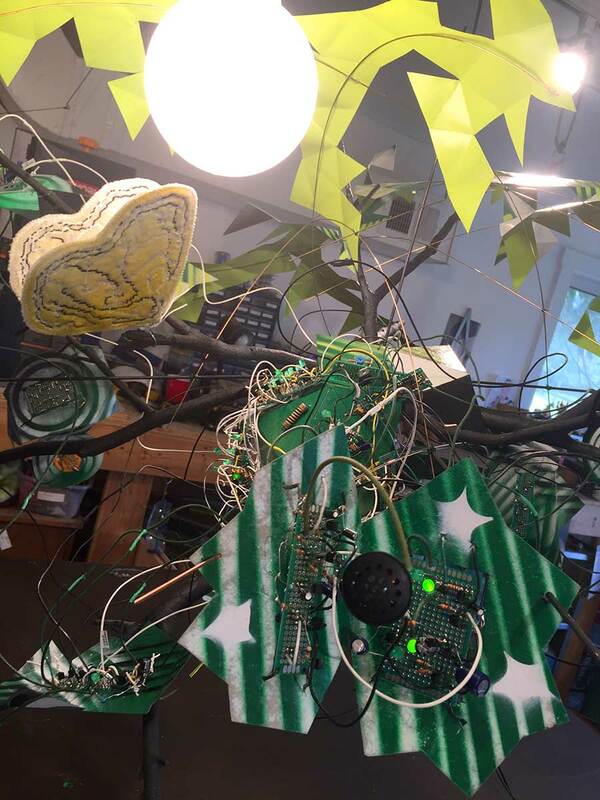 The soldered perfboard is embedded in a cardboard cutout that is painted to look like a forest creature sounds. Soon, this mixed media object will be joined with other embellished animal circuits to build a vignette of nocturnal musicians. I hope you&apos;ve enjoyed my content thus far. Stay tuned for updates as I build a sculptural "electrolier" of the night in rural Virginia, as well as entirely new animal circuits based on my experience of the Mayan jungle. I&apos;ve launched a GoFundMe campaign to finance electronic supplies for hacking nature&apos;s musicians in Akumal, Mexico. If you&apos;re interested to support me in this endeavor, please visit gofundme.com/hacking-nature039s-musicians-mexico Thanks so much! The question of how to conduct a chorus of nature&apos;s musicians is perplexing because humans aren&apos;t in charge --Mother Nature is. The idea of physically "playing" a cricket or other musical animal is compelling, but I&apos;ll leave that (cruelty-free) implementation to someone who knows how to play an instrument. My approach is to let Mother Nature conduct her own, which is to say, allow a circuit to control an electronic chorus. What I want is an autonomous master sequencer that runs indefinitely, controlling the noise of multiple animal circuits in a seemingly random way, but never so abhorrent as to be unbelievable. My control circuit doesn&apos;t have to be truly random according to cryptologists, but it does need to be unpredictable for the average observer. Otherwise, listeners will detect a pattern and the effect will be unconvincing if not downright annoying. The key to my solution is a circuit designed by Charles Platt called "Really, Really Random Number Generator" that was published in Make Magazine in May, 2015. Platt combines a white noise generator (a source of true randomness) with a Schmitt inverter and shift register to produce a never-ending sequence of random bits --eight bits, to be precise, as that is the output of the shift register in his design. I encourage you to read his article and study his schematic, as he does an excellent job of explaining the design principles and I am only standing on his shoulders (as in "standing on the shoulders of giants"). If you refer to my schematic "Mother Nature Board (random pulse gen).pdf" included in my project files, you will see that Platt&apos;s design makes up the lion&apos;s share of what I&apos;m doing to simulate Mother Nature&apos;s timing. I made a few changes to his circuit because I am running at 12V instead of 18V, and I use a larger capacitor for the Schmitt oscillator because I want a slower clock for my shift register in order to see the state changes (plus, this is how I get so many bonus fireflies and other LED eye candy). The remainder of my schematic comprises two basic functions: logic gates to generate further random pulses, some of which occur less frequently than the states of the shift register; and a collection of 555 timers in monostable configuration, aka "one-shots" to generate pulses of longer duration. -- The circuit is sensitive to noise. -- Not all 2N3904 transistors are made the same, and you must get the right one for the noise generating part of Platt&apos;s circuit. I tested multiples from my collection and some worked, while others did not. If your shift register isn&apos;t shifting, it&apos;s probably a problem with the noise generator. -- The trigger into the 555 monostable (one-shot) is active low. You can use leftover inverters in the hex Schmitt IC or build your own, as needed. -- Careful about impedance. The logic ICs can&apos;t drive much of a load, so you might need to add a transistor switch in-between (especially when you want one output to control multiple things). This also applies to the output of the one-shots. Last but not least, here is a video without sound that is intended to show the different elements of my Mother Nature Board. Pay attention to the LEDs: they reveal how the states are changing at various points in the circuit. *This log is an extension of my last entry, so please start there if you want more information about how the following work of art was made. I finished breadboarding my circuit for a Lesser Angle-winged Katydid. Then I forced myself to document it with a schematic -- "forced" because my tendency is to go on inventing things and forget my design history, and I have learned the hard way that I must solder an instance of my schematic to be sure that it&apos;s accurate. It&apos;s all good, though, because building a permanent circuit gives me a future reference to use alone or in parallel with other sound-generating circuits. Many of my circuits are sensitive to noise, so I try to test them in combination before I send out board designs or embark on a larger piece. I got into the habit of making these electrified watercolor studies in the days before I used software for schematic design and printed circuit board layout. You can see images of early works here. As time goes by, these studies help me to remember why I designed the circuit in the first place, like a bookmark for a time and place in life. I realize that there are more practical ways to archive a circuit, but it&apos;s a good excuse to make art. Here is a video of the Katydid "rattling." I included a couple of crickets to give the Katydid&apos;s sound a more natural context. To conclude this log, it occurs to me that some of you might not have drawing or painting skills. While I can&apos;t teach you to be an artist, I can suggest this useful hack: project an image and trace it. Please refer to the instructions associated with this project for more details on "How to draw if you have no artistic talent." In the southeastern United States, the ring-tone chirping of crickets at night is accompanied by a percussive rattle that&apos;s common from mid-summer through fall. Where I live in northwestern Virginia, the dominant percussionist in our nighttime chorus is the Lesser Angle-wing Katydid. Similar to cicadas in timbre, but far less annoying, these bugs "shake their rattle" intermittently, calling once or twice and then going silent for five to fifteen seconds. Compared with a regularly chirping cricket, the delay adds complexity to an analog audio "Katydid circuit." You have to create the timbre and tempo of a rattle sound, and then you have to space out "packets" aka "envelopes" of this effect with silence in between --ideally randomized for natural effect. In a first step, I built a machine gun circuit using a 555 timer. While the tempo is right, the timbre of a square wave is dull compared with a Katydid&apos;s sizzle and resonance. I reverted back to my cricket strategy and built two discrete transistor astable multivibrators, but that didn&apos;t work either because the simplicity of my cricket circuit depends heavily upon the acoustical properties of a 2.8 KHz piezo disk element. Katydids are resonant in a different frequency range than crickets. To make a long story short, I had to build a filter. With some minor adjustments (not needed for functionality--purely my preference), this circuit works perfectly to add sizzle, resonance, and noise to the output of an astable multivibrator. Note that I decided against a piezo disk element because --for a Katydid-- I prefer this little speaker (now obsolete but hopefully similar exist or I have more reverse engineering in my future). Here&apos;s a video clip to demonstrate the Katydid sound timbre. Notice the subtle complexity thanks to amplified noise from the abused bipolar transistor (gosh, horrible sentence out of context). Since I&apos;m on the topic of speakers and timbre, here&apos;s another video showing an overview of the circuit (including a second astable multivibrator for regular chirp) in which I demonstrate the Katydid&apos;s rattle through several different types of speakers. I end with a cool way to "play" a piezo disk in its housing. Electronic musicians: even if you find the earlier part of this video boring, check out the last 10 seconds for inspiration on how to physically manipulate the output of your synth to get a new electronic sounds. Because I am piezo-obsessed, here&apos;s one more clip showing a bare piezo disk element as the output for this circuit (which provides sufficient amplification that my custom printed circuit board is not needed). I mess around with different connections to the feedback of the piezo (white wire), the last seeming to make a change -- a potential source of interesting effects that warrants further exploration. At the end of the clip, I show how the piezo sounds (differently) in different positions inside of a plastic housing. In my next video, I show some of the cool effects that you can get by playing around with capacitors in an analog circuit. Be forewarned that you risk blowing one of your components (so careful if you don&apos;t have replacement parts). It amazes me how much one capacitor can change the behavior of a circuit -- and this fact extends to resistors and diodes as well. Especially note the weird chatter sound that I get about 1/2 way through this clip (start at 00:36). Get your parts. You need a raw "piezo with feedback" disk element that is rated for 2.8 KHz frequency. (These instructions will work for 2.7 KHz - 3.5 KHz.) The important thing is be sure that your piezo has feedback (MFG). Digikey sells them, and I&apos;ve also bought some on eBay. -- 22 gauge (or less) wire in three colors (corresponding to MFG of the piezo). Manufacture your circuit board. You can either work from my schematic ("Piezo_amplifier2") or send my Gerber files to a manufacturer. The files you need are uploaded to this project. If you&apos;re unsure about my circuit, then breadboard it first. Solder your board. Be careful soldering to the piezo disk - they are delicate. Avoid stiff wire for this part. Give yourself enough length that you can position the piezo but not so much that you have extra bulk. Unless you are adding an optional resistor to my amplifier board (see R4) --and you probably aren&apos;t-- then put a jumper to ground here. Give yourself longer wires on "input" and "GND" so you have something to work with. These are where you will connect to the audio signal and common ground of whatever circuit is generating your sound. Put your piezo and circuit board in a housing. Careful when you bend the piezo wires and don&apos;t let the components cause a short circuit. You might want to stick a thin piece of non-conductive material between the board and the piezo disk, but remember that anything touching the piezo will likely change its sound quality. You can play with this, too, by stuffing non-conductive materials into the housing - like cotton or foam. I&apos;ve tried affixing the piezo disk to the housing with a short piece of plastic tubing superglued to the center. That works well. Play around with it until you get the sound quality that you like. Connect your speaker to a low voltage audio signal and common ground. By low voltage I mean like 6-12 volts. It might work with higher voltage but I haven&apos;t tested it. I will add of couple of animal circuits to this project that you can build to generate the audio signal. Get my schematic. Download my project file "Heaton_transistor cricket.jpg." Other piezo electric speakers to play with (i.e., piezo elements that are sensitive at other frequencies, or speakers with a different physical housing). You can try 8 ohm speakers (and should for insight) but I doubt you&apos;ll like the sound if "cricket" is your aim. Extra components (especially transistors) if you intend to tweak the circuit because you might fry something. Build a cricket according to my schematic. A lot of people will argue that this method is cheating --to which I say, cheating who? Andy Warhol regularly traced his images, as have many other artists throughout history. -- On your computer, get a digital image that you want to trace and open it in a photo viewer of any kind. Photo editing software is handy if you want to zoom in, scale, enhance contrast (for improved visibility), or otherwise change the image. -- Adjust your computer&apos;s system settings so that it won&apos;t go to sleep or launch the screen saver. -- Hang a sheet of paper on the wall and project your image onto it. Move the projector closer or farther away to get the size that you want. Some years back i experimented with very simple oscillators using NPNs set up as Negistors. They generate a sawtooth like wave that has plenty of harmonics. I cascaded 2 PN2222A (i tried several parts such as BC547B, 2SC945, S9014D, etc, and all them worked with variations) by connecting 1MEG resistor from the colector of the first transistor to the base of the second (in Negistor set up, aplying a voltage to the reverse biased base works as a VCO) and i had a nice chirp cricket sound with just 2 transistors and from a 12V supply. First transistor was a LFO and second was an audible frequency oscillator. By varying part values you can simulate crickets, birds, etc. Thank you so much for this suggestion! I am about to tackle a whole new range of sounds as an artist-in-residence at the Tortuga Escondida center near Akumal, Mexico (basically, in the middle of the very "musical" tropical jungle). I will definitely give this a try and post updates on my discoveries. Thanks again! I love these, do you offer any work for sale? A five channel Linkwitz-Riley active crossover for a multi-amp sound system that's also pretty! You are about to report the project "Hacking Nature’s Musicians", please tell us the reason.